Food pouches have become a hot new item for kids and parents. My 6yo enjoys them just as well as my 2yo does. The drawback to these pouches? Their price tag! Press Pouch is an easy to use, reusable food pouch. You just fill it with a ready to eat snack! The pouches have a large zipper style closure at the base for filling and cleaning, a choke-proof cap and a large preview window to help you keep track of what is in each pouch. Press Pouch is made from high quality BPA, phthalate, and PVC free materials. 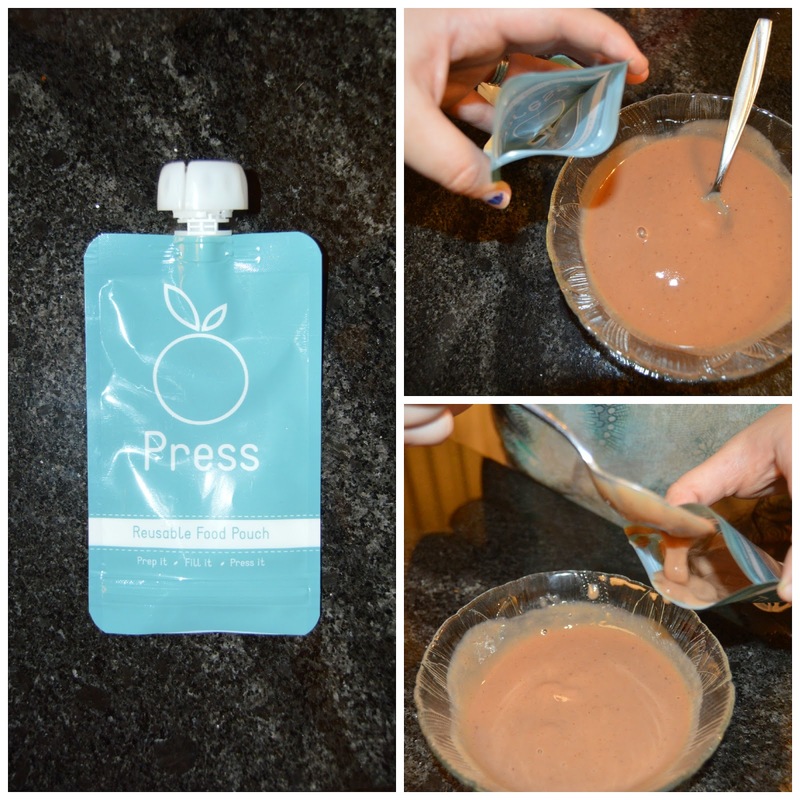 Press Pouch can hold things like applesauce, smoothies, pureed baby foods and so much more! To make the pouch even more convenient, Press Pouch is also dish washer safe! Keep reading to see what we thought about the Press Pouch! We have really enjoyed using our Press Pouch. My 6 year-old has taken it to school with applesauce or pudding in it, which eliminates the mess a dirty spoon makes in his lunchbox! My 3 and 2 year olds have argued over whose turn it was to use it for snack time. I made a plum, carrot, oatmeal and sweet potato puree for one snack time and was pleasantly surprised that the packaging came completely clean in the wash without a trace of one single stain! I haven't had any issues with my children being able to open the zipper part, but the only one that has really showed any interest in it is my 2 year-old. I would say that I even have a hard time opening and closing the zipper sometimes. Visit the Press Pouch website here.